Options include Shovel Kart, Spelunky- and Zelda-likes. Deciding what thing you're going to make is often surprisingly difficult, so I can understand why Shovel Knight developer Yacht Club Games has outsourced picking the premise for its second game to its fans. OK, so it hasn't done that exactly, but it has released a poll asking fans what sort of game they'd like to see next from the studio. There are a bunch of ideas on the form, and you can rate each one on a scale from 'not excited' to 'very excited'. The ideas include a Shovel Knight sequel, a Shovel Knight-themed karting game (not sure they're being entirely serious there), a Spelunky-like, a Metroidvania, and various others styled after retro games you may have some nostalgia for. It's a bit sad that every idea is framed in relation to an existing game, but then again Shovel Knight is great, and fairly original, despite owing a lot to Mega Man. Me, I want Yacht Club to make whatever game it wants to make next, but if it's totally stumped by indecision, a new Landstalker-ish isometric action-adventure could be pretty fab. 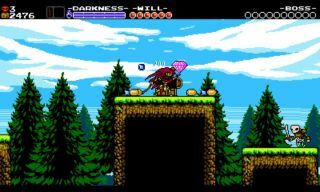 In case you missed it, Shovel Knight is getting another free campaign, this one starring the acrobatic, British-autocorrect-hating Specter Knight.